They say “neigh,” not “eh.” But in many ways, says Suzanne Spierenburg, the Canadian equine breed is a typical Canuck specimen. 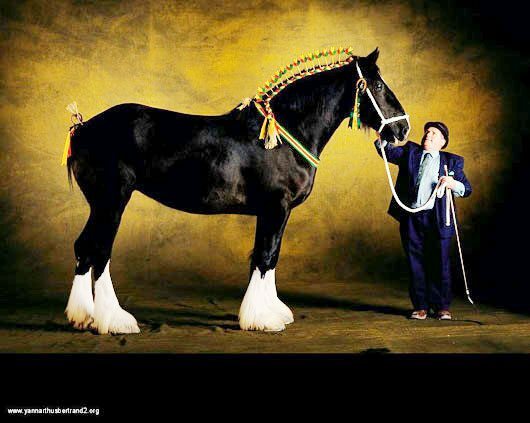 The Canadian, named the national horse of Canada in 2002 by parliamentary decree, will be on display – as will 16 other breeds of light horse – as Horse Haven saddles up for another 10 days during the 2011 Calgary Stampede. 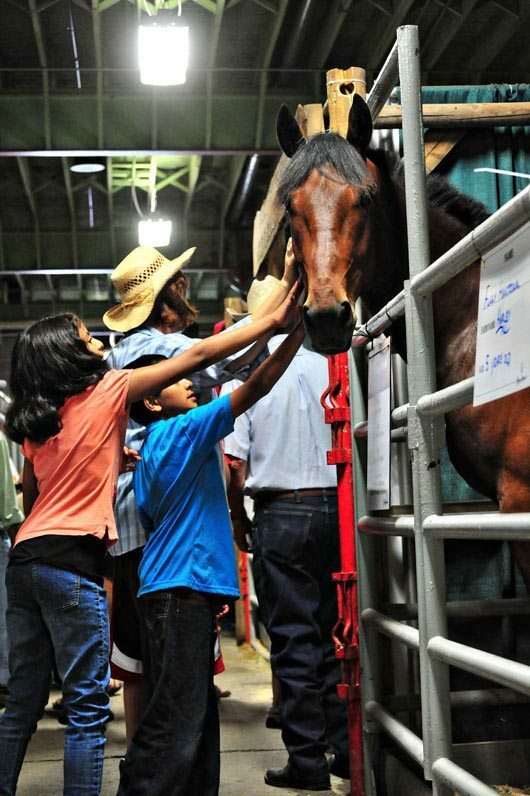 Open daily from 11 a.m. to 8 p.m. in the north end of the Agriculture Barns, and adopting a Western setting, Horse Haven will feature presentations, demonstrations, and plenty of horse sense as breeders talk up their equine companions and promote the breed they love. 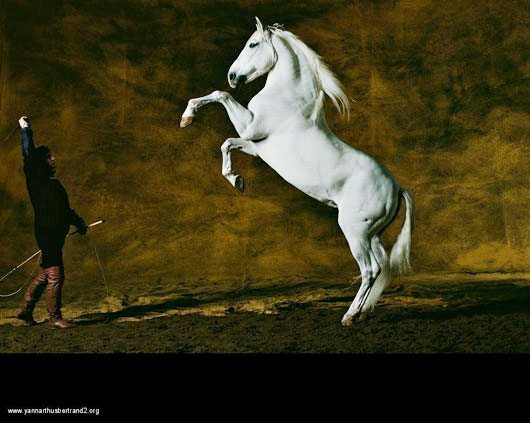 Horse Haven, featuring 17 breeds of light horses that live and thrive in Alberta, will feature presentations, demonstrations, and plenty of horse sense during the 2011 Calgary Stampede. 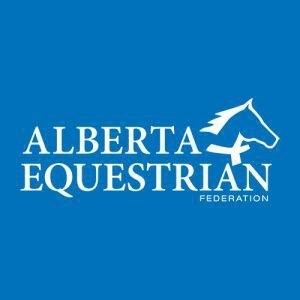 Horse Haven will feature 17 breeds of horse that live and thrive in Alberta – Appaloosas, Canadians, Curlys, Foxtrotters, Friesians, Gypsy Cobs, Miniatures, Morgans, Norwegian Fjords, Paints, Paso Finos, Peruvian Pasos, Quarter Horses, Standardbreds, Tennessee Walkers, Thoroughbreds, and Welsh Ponies. 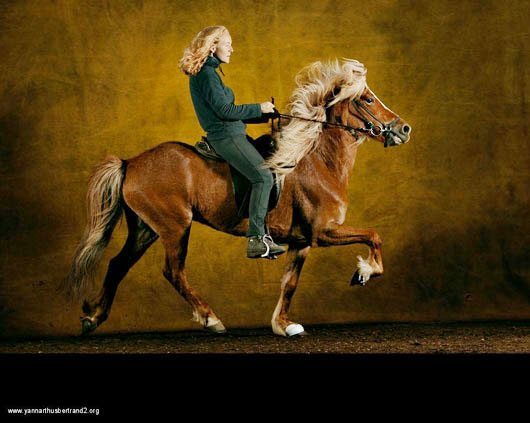 These light horse breeds can be seen in action daily during demonstrations in the Northern Lights Arena and the Big Top. 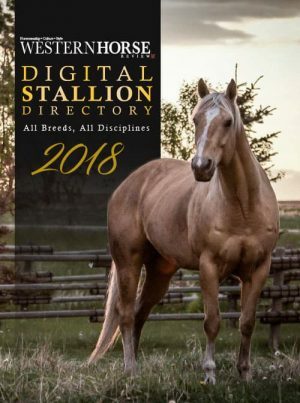 “It’s really interesting to come see all the different types of horses out there, and the types of things they do,” says Kristin Hack, a vice-chair of the Stampede’s Light Horse committee. 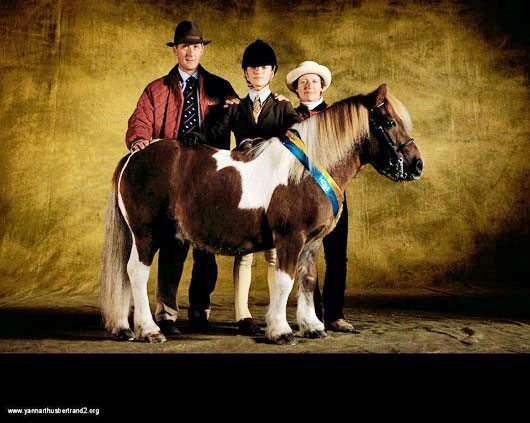 “The Missouri Foxtrotter, the Tennessee Walking Horse, the Peruvian Paso, and the Paso Fino are all bred for their smooth riding gaits, so they cover distance in a comfortable fashion. 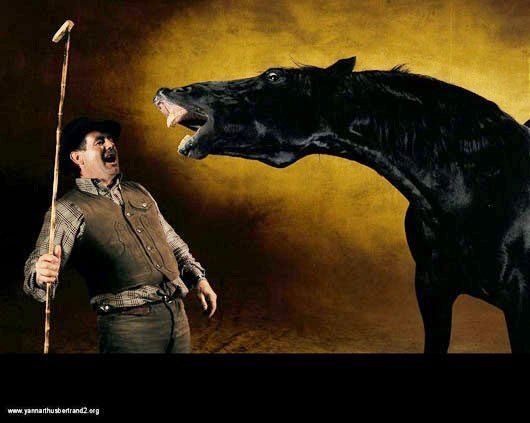 The Canadian, which originated from horses sent to Quebec by France’s King Louis XIV during the 17th century, earned a reputation as an easy-keeping and extremely hardy animal. 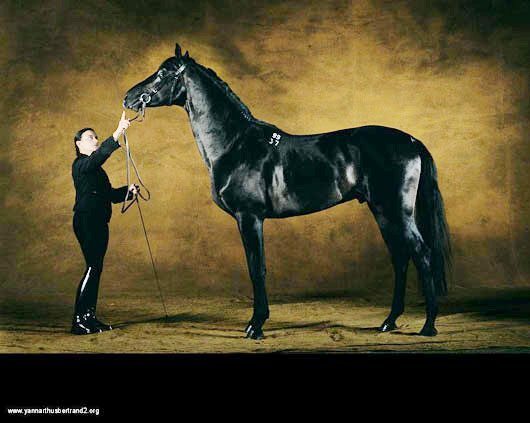 Influential in developing other North American horse breeds, such as the Morgan, the Tennessee Walker, and the Missouri Foxtrotter, the versatile Canadian was used for logging, coach transportation, and riding, and was considered the strongest light horse, pound for pound, in the world — with a great nickname (“The Little Iron Horse”) to boot. 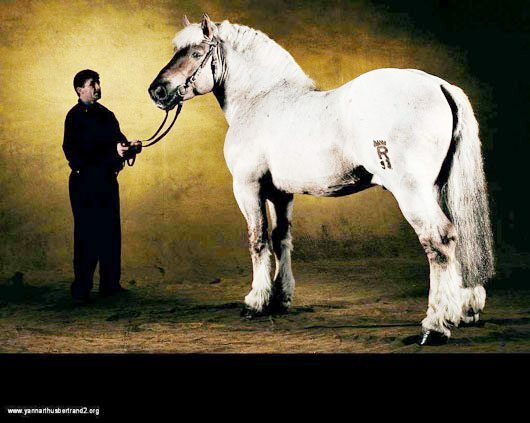 Spierenburg first began working with Canadians about 20 years ago after the late Alfred Carter, of Winfield, introduced the breed to Alberta. 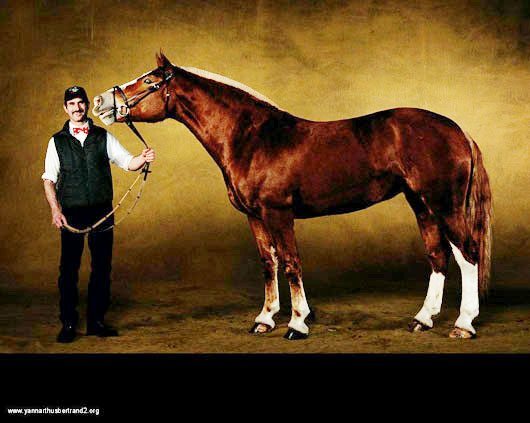 Spierenburg showed Canadians in the Battle of the Breeds at Spruce Meadows for three years, began breeding the animals not long afterward, and has extolled the virtues of the breed at Horse Haven for the better part of a decade. Horse Haven will feature plenty of interactive opportunities, with a larger “activity zone” involving displays and demos regarding horsemanship. Representatives of the University of Calgary’s Faculty of Veterinary Medicine will also be on hand to make educational presentations. 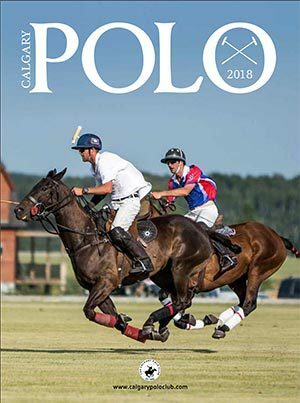 “It’s focusing on the idea of horsemanship – giving the public an opportunity not only to see what people do with their horses, but what it takes to be able to do those things with their horses,” says Hack. Equestrian vaulting, a new, must-see light horse demonstration, will take over the Big Top on Monday, July 11 at 12:45 and 2:30 p.m. A combination of gymnastics and dance on horseback, vaulting teaches children and adults to move in harmony with a horse, as well as improving balance, flexibility, strength, and teamwork skills. 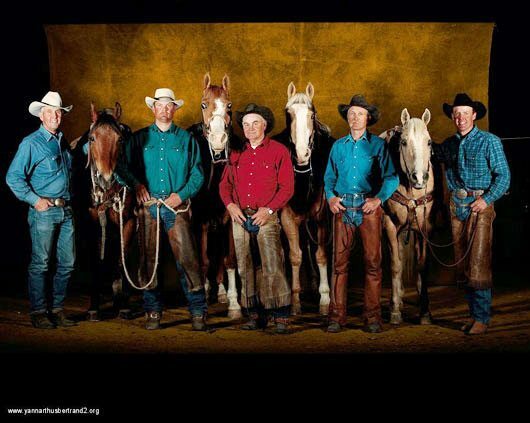 The boardroom will also come to the barn again this year at Horse Haven – as The Natural Leader, an Alberta-based company, uses the relationship between horse and handler to teach companies how to build effective corporate leadership, communication, and team collaboration skills. The Natural Leader takes centre stage in the Northern Lights Arena on Tuesday, July 12 at 10 a.m. It snowed today at the log house. A significant amount. Enough to scrap off the deck. Alright, I didn’t, but I could have. Instead, the snow reminded me of this idea stewing in the back of my brain for a 12 weeks ’til Christmas series on Screen Doors & Saddles, with my best shot at the most unique gift ideas for y’all I could think of. Equus-related of course. Problem is we’re nine weeks and a bit from Christmas today. Like where did October go? I know you’re with me on that. So, I’m going to do this thing regardless. Just do it. I’ll throw in the missing weeks here and there. Try and keep up with me. To rocket this series off in high fashion, I’m going to share with you one of my favorite books; a compilation which I guarantee would be an incredible addition to any horseperson’s library. 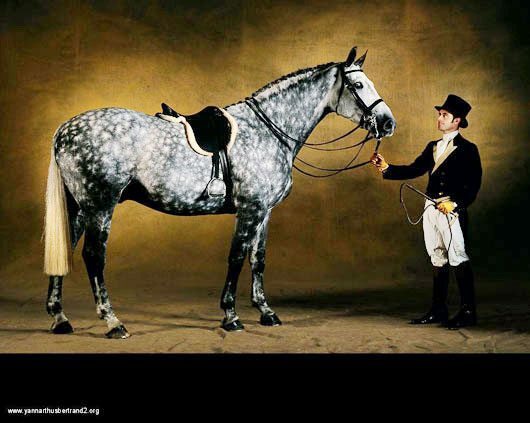 Technically, Horses, by French photographer, Yann Arthus-Bertrand, might be categorized as a horse breeds book, but it is anything but an A-Z encyclopedia. It’s more like a cornucopia, actually a gallop, indeed a full-out stampede in the greatest of glory, riddled with richness, lavishness and incredible depth and diversity. If there were an America’s Next Top Horse Model television series, Arthus-Bertrand would be Nigel Barker. 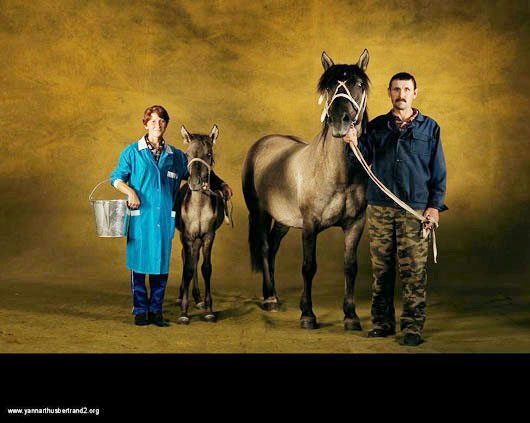 Renowned photographer, with an incredible eye for capturing the essence and true beauty of the equine. I give you the forthcoming cover of Italian Vogue. 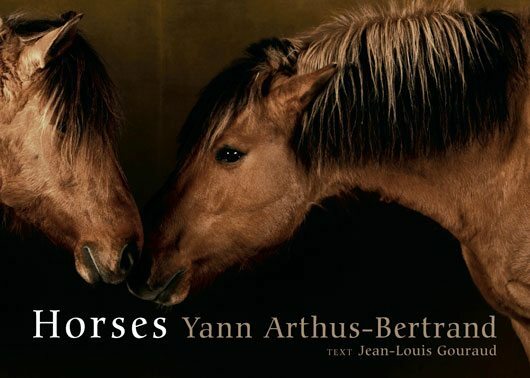 Arthus-Bertrand travelled the earth and eventually completed a 15 year project of photographing animals, horses among them, against a plain backdrop, treating his subjects more as models than animals. 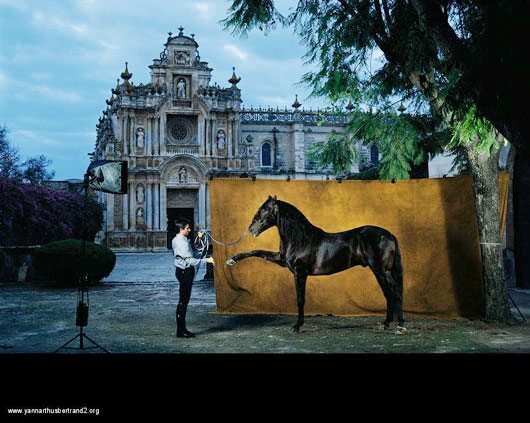 The result is the photographic captivation of horses that are not only a departure of the four-square traditional profile shot, but animated beyond belief, even surreal at times, and in all cases, most definitely alive with the spirit of the equus. It is a collection you cannot help but fall in love with. I gaze through this book and stand in complete awe. Of the connections we hold with the people of the world. Of the history of the world. Of my horses, and all they represent. This book brings all of it crashing into my little corner of the world. 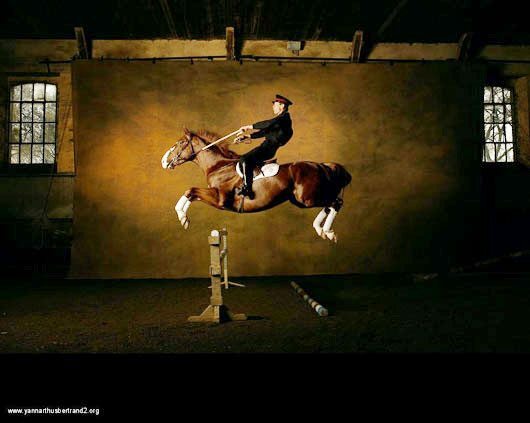 Majestic is a word often over-used as a descriptor of the horse. Here it stands true. 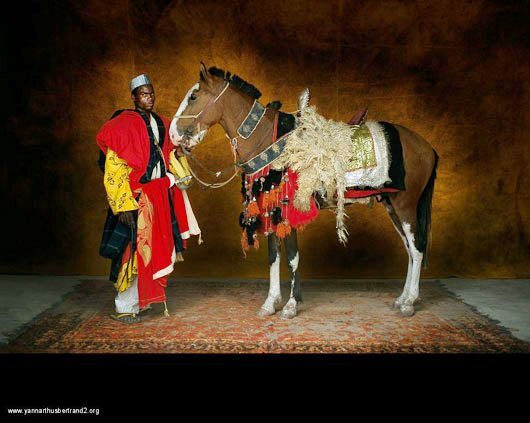 While the breeds we are most familiar with are represented, it is the stunning photos of horses from the most far-flung regions of the world which most capture my heart. Not to mention their incredible handlers. 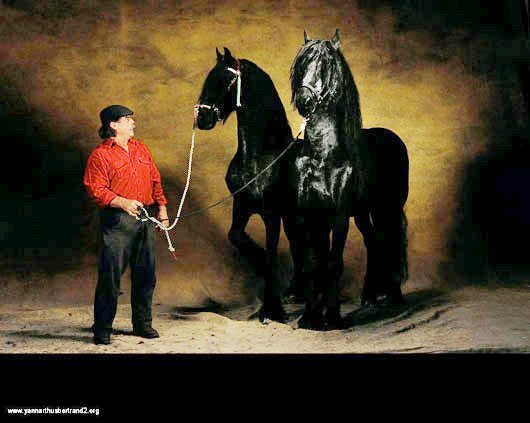 These are the heavy horses. In all their glory. The handler, in all of hers. And wearing dress slippers! Bravo! 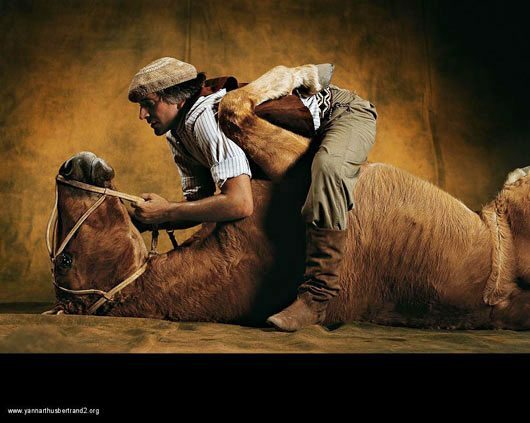 Cowboys and their mounts are liberally represented. 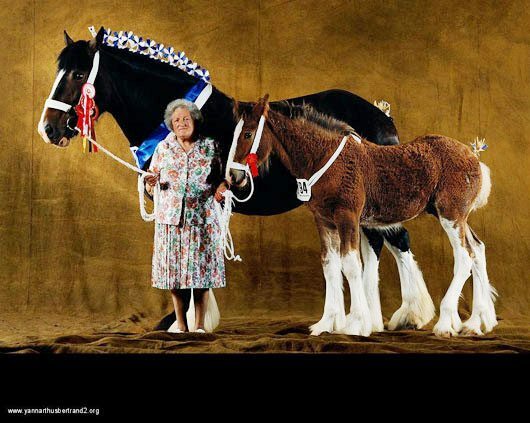 As are a Canadian western horse breeder couple. But, I won’t spoil that for you by previewing it here. 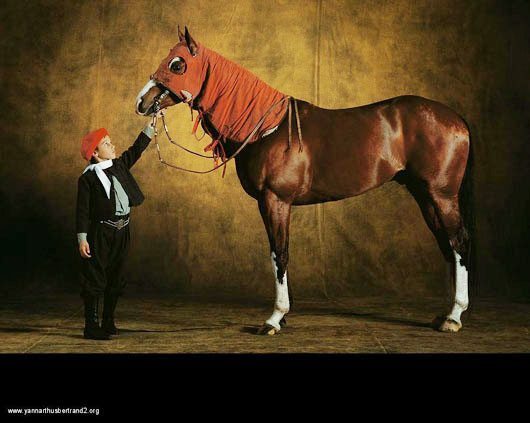 The Argentina section enthralled me, including the stunning athletic sleekness of this polo horse. 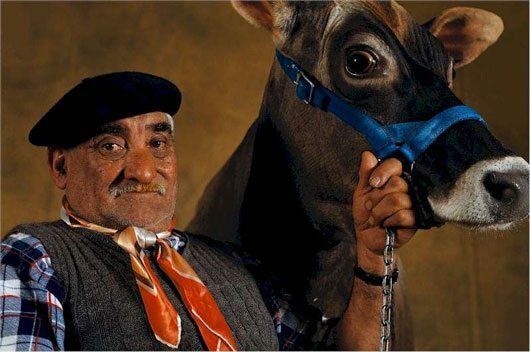 And this breathtaking shot – an Argentine Criollo cow horse, with his trainer. I love this book so much, and I’m happy to share it with you. 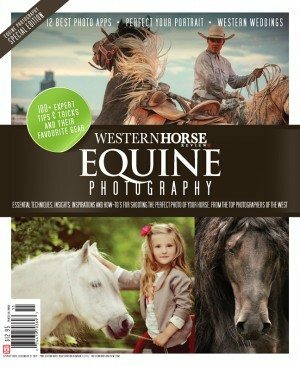 But, if you’d like your own copy, we added it to the Western Horse Review store, for your convenience, if you wish to order. Or, you can find it at the usual online outlets such as Amazon. 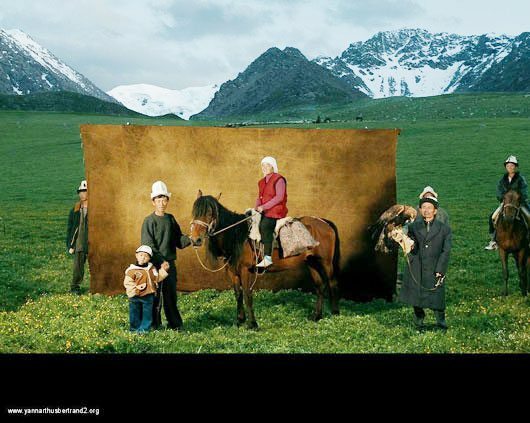 By the way, Yann Arthus-Bertrand didn’t reserve his camera for only the equine. 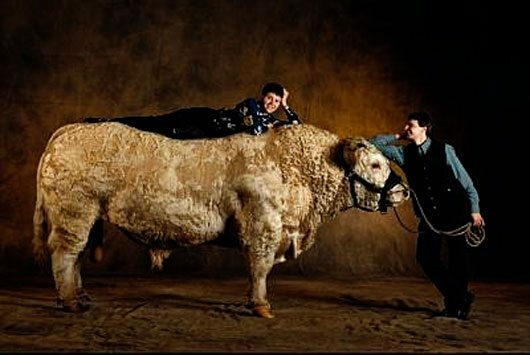 For you cattlemen and women there is a book of livestock as well with such specimens as this magnificent bull . . . I refer to the Jersey, not handler.